Mayawati born in Delhi on January 15, 1956 the daughter of Prabhu Das, a humble Telecon Department clerk, her rise to prominence in politics has been nothing less than phenomenal. Her family home in Badalpur is long gone and is replaced by a mansion. Her old village also wears signs of new prosperity. ”She belongs to the oppressed class and knows what it is like being discriminated against. She has experienced it,” said Panna Lal, Resident, Badalpur. Following a career in Law, Mayawati fell for the Civil Services dream. But this was when she met Kanshi Ram, who was running BAMSEF, an employees’ federation. It was at that time that a 22-year-old Mayawati was drawn by Kanshi Ram’s appeal for Dalit pride and left her home. In 1984, Kanshi Ram started the BSP – the beginning of a new Dalit consolidation – and Mayawati was in step with her mentor all the way. 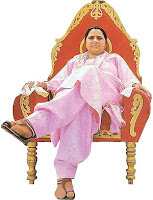 So it was no surprise when on December 15, 2001 Kashi Ram declared 45-year-old Mayawati as his political heir. On September 18, 2003, when Mayawati took over as BSP’s National President, Kanshi Ram was ailing.